Usually announced as cuina casolana, based on the purposes of the Mediterranian diet: Soups, salads, meats, fish and seafood, snails (especially in Lleida during "L'Aplec del Cargol" by early May), desserts ("Crema catalana" or catalan cream, a variant of creme brulée) or "Braç de gitano" which is a long roll made of whipped cream and sponge cake, similar to swiss rolls. Pa amb tomàquet: bread with tomato. Many people in Spain are surprised when discover the Catalan way to prepare "pa amb tomàquet", because instead of being sliced tomato with bread, the tomato (sometimes with garlic) is squashed and spread in the bread slice, dressed with extra virgin olive oil and small cuts of a very Catalan specialty: cured pork meat, that is, the famous Iberic ham (Spanish for "jamón" and "pernil" in catalan"), "fuet", "xorís" or "butifarra" (spicy cured sausages), sobrassada, or other stuff like cheese or larger pieces of cooked meat. 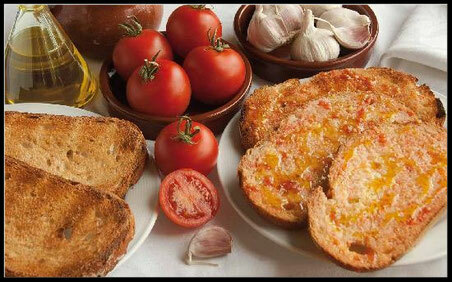 "Pa amb tomàquet" is a very deeply rooted meal in Catalan houses. Paella: Typical rice dish from the Catalan Lands. Catalan paella is with seafood, while Valencian paella is without seafood. There's also a variant of paella which is made up with little noodles called "fideuà". In addition, paella and fideuà can be prepared with black squid ink, then it's called "fideuà negra" or "arròs negre" (black fideuà and black rice respectively). Consider checking books by Carmen Casas, a restaurant critic and a world-renowned expert on Catalan cuisine. Don't miss the good Catalan wines and caves. Catalonia has had a very rich tradition of wine makers through history, and nowadays is a credited producer of world famous wines. "Penedès", "Priorat", "Costers del Segre", "Alella" and "Terra Alta" are good "D.O. "s ("Denominació d'Origen" or designation of origin, the Spanish administrative division to control and preserve wine producing areas). Sangría is also served in most restaurants, with large variations in quality.